I was looking forward to trying the food out here at this chain restaurant. 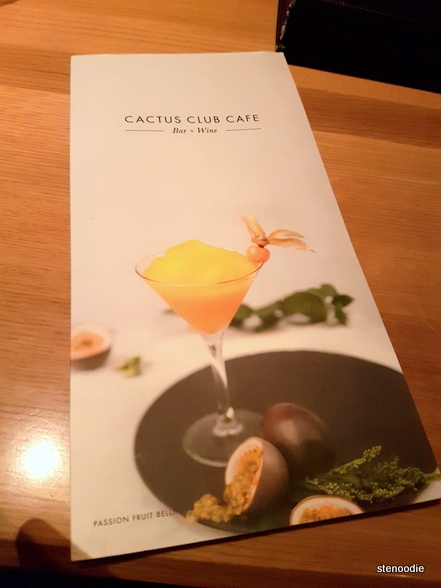 The first time I had heard of Cactus Club Café was actually through some controversy on Instagram or Snapchat where apparently from what I remember one of the bouncers had given a racist or sexist remark to one of their guests and kicked them out, at which point the guest blasted the restaurant all over social media and encouraged others to boycott the restaurant based on that single incident. Nancy had made a reservation for us for 5:30 p.m. and when we arrived, there was quite an impressive line-up to get seated. The venue was very posh and upscale (you can expect lots of suits here, but at the same time there is no dress code so you can show up in jeans and nobody should be batting an eye). 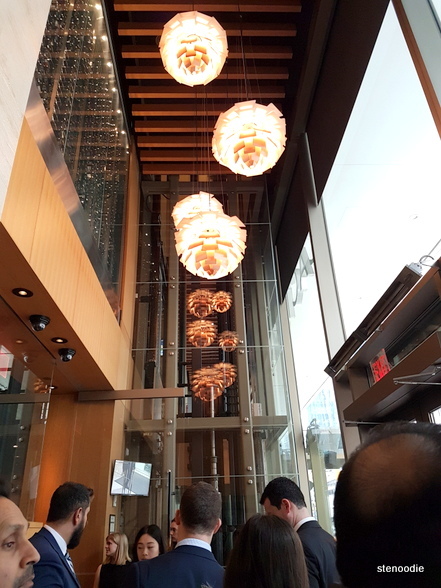 After the hostess acknowledged our dinner reservation at the front, we were led up to the second floor. Since I had my heavy work bag with me, I was relieved to find that they had an elevator to bring us up which I gladly accepted to use. 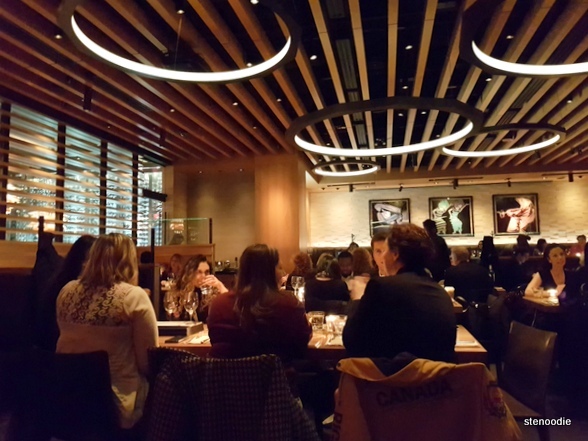 It was a Thursday evening, and the restaurant was already packed with many patrons in the dimly lit and posh space during this early dinner time frame. We were seated at a large booth seat which easily could have fit four people. Our server that evening was exceptional at making sure that our needs were fulfilled. 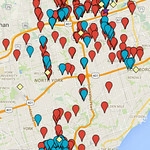 Again, for this type of restaurant in this area of Toronto, anything less in terms of service would have been a big no-no. I have been getting into the habit of viewing pictures of the food at restaurants online before I arrive (I never used to do this). Thus, I had a good idea of what I wanted to try and order. As I knew our evening would not only consist of actual eating but lots of chitchat and stories for a long-awaited girls’ night, I didn’t want to order anything too substantial since I knew that I either wouldn’t have enough time to eat or enjoy my meal while chitchatting. I wanted to choose something where I didn’t have to eat with my hands and something where I could focus on small bites while listening or be able to speak without having my mouth full. 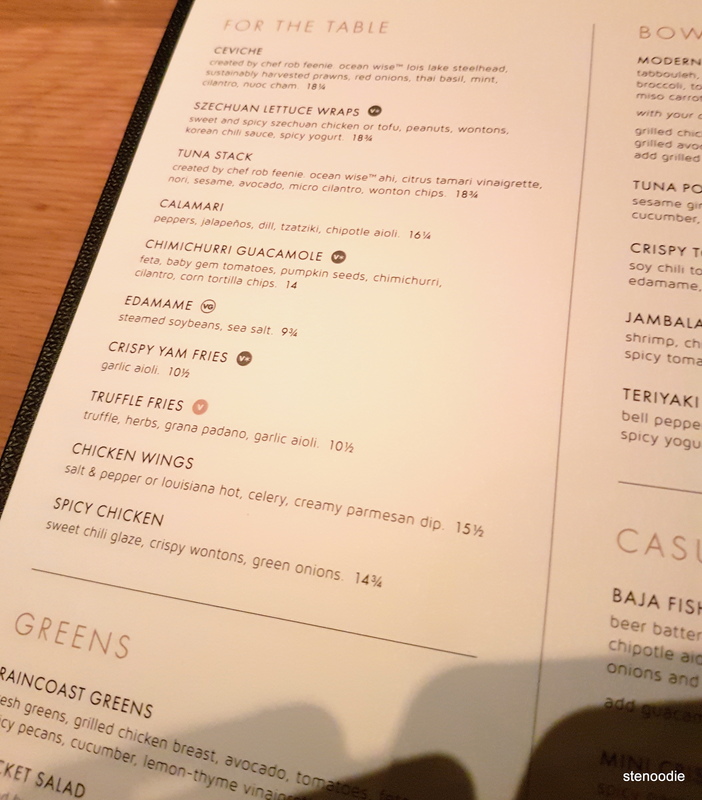 A colleague of ours recommended the Chimichurri Guacamole and the Spicy Chicken bites as appetizers to share when she found out we were heading to Cactus Club for dinner. 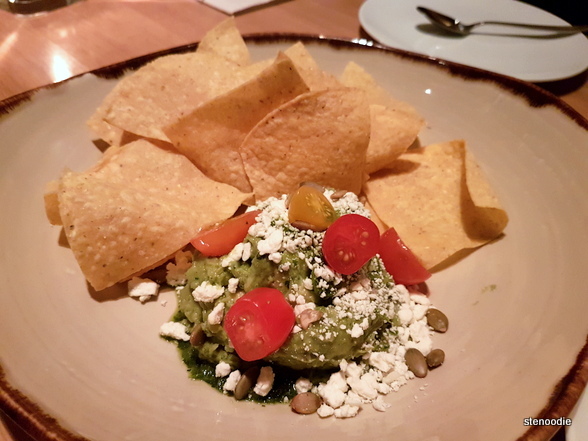 When we inquired with the server about potential appetizers, she also seconded the Chimichurri Guacamole, at which point we decided to order it. Unfortunately, this Chimichurri Guacamole didn’t hold up to our expectations despite being raved about with two recommendations. It was a platter with corn tortilla chips and a measly serving of guacamole with feta cheese, baby gem tomatoes, pumpkin seeds, chimichurri, and cilantro on top of it. It wasn’t a particularly generous portion but good enough for three people to share. The taste of the guacamole was quite good but mediocre. I did like the feta cheese in it, but that was about it unfortunately. I’m not sure why this appetizer was raved about so much? For my main, I ordered the Tuna Stack (it’s actually an appetizer meant to be shared). 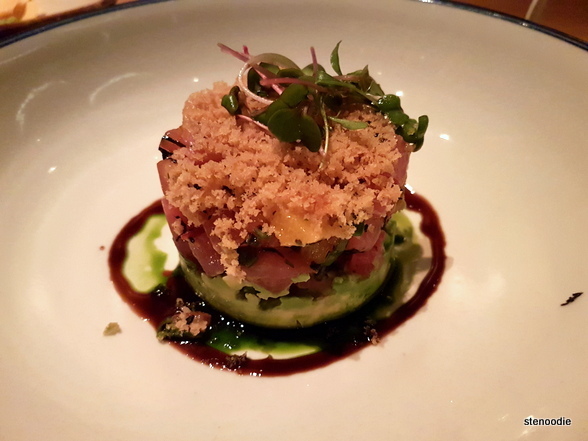 It’s a dish created by Chef Rob Feenie with ahi tuna, citrus tamari vinaigrette, nori, sesame, avocado, micro cilantro, and a generous serving of wonton chips on the side. 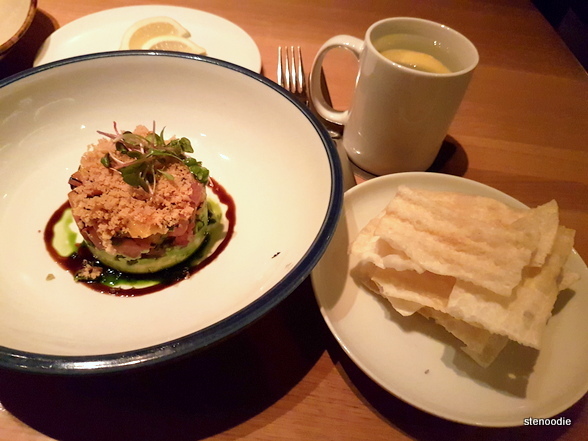 The Tuna Stack was as pretty as expected when compared to the online images I had seen previously. I actually found it to be a great dish to eat by myself. There was lots of cubed ahi tuna in the dish and the flavours were nice together. It was a light-tasting dish since it’s mostly fish and fruit. The wonton chips were super crispy and crunchy. I put the wonton chips into the bowl and smashed them up with my spoon to eat the whole dish spoonful by spoonful. This Tuna Stack also reminded me of a similar tuna stacked dish that I’ve had at Joey’s. 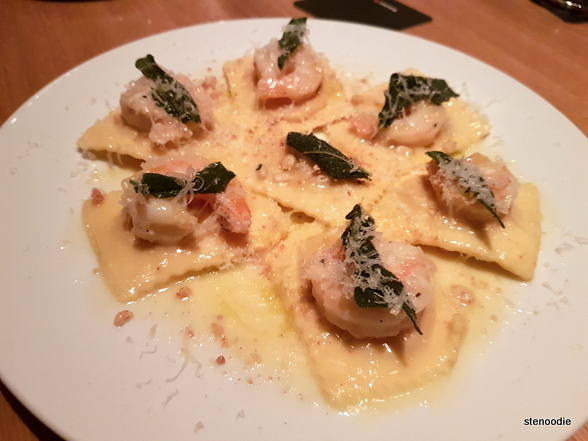 This Butternut Squash Ravioli was gorgeously presented with all of the individual ravioli sitting on the plate with a single sautéed jumbo prawn on top of each one. Christal was generous to cut us half of one ravioli to try (I didn’t want to take a single full one from her!). Wow, I was so impressed with the taste!! The ravioli had butternut squash and mascarpone inside of it with truffle butter, pine nuts, and crispy sage. The butternut squash and mascarpone were amazing combinations! It tasted so smooth and melt-y inside the ravioli! No wonder this was the Chef’s signature dish and why so many people ordered it. It was delicious. 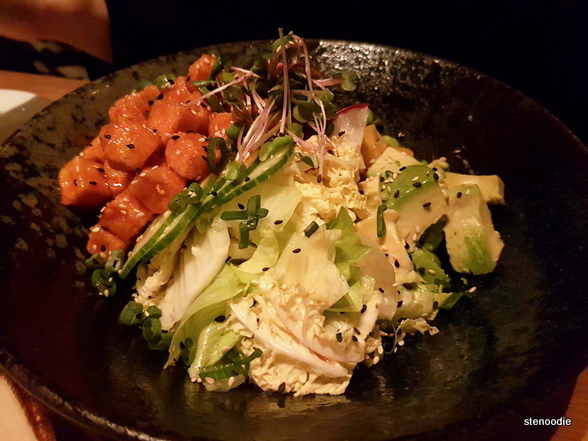 Nancy ordered the Crispy Tofu Bowl, which had soy chili tofu, jasmine rice, mango, cucumber, avocado, edamame, and radish. Everything was all chopped up and bite-sized inside the bowl. I tried the soy chili tofu, and it was so tasty! This was a vegetarian dish, and this tofu reminded me of mock chicken. The server came to check on us regularly throughout the night which was appreciated. She definitely had a talent for small talk, which I again wasn’t surprised about considering she is employed at a big Financial District restaurant where lots of professional suits come for lunch and dinners. Nancy chose a dessert, which was the Caramel Chocolate Mousse. You could choose a single, double, and triple serving, which was a fun “dessert shot” kind of idea. Nancy got the single serving. It looked super cute in a little glass and surprisingly was bigger than I thought (considering I had the idea of a shot glass portion in my head). 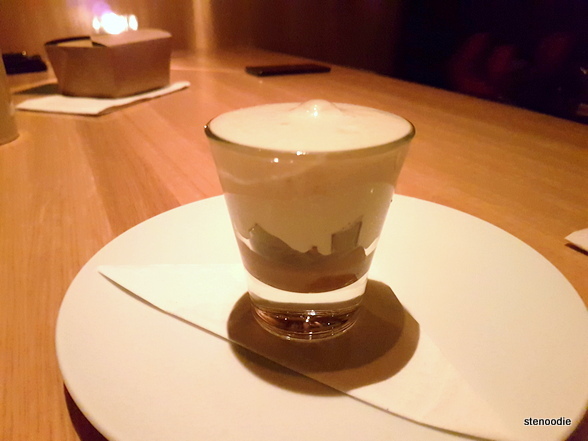 It had warm caramel foam, crunchy sponge toffee, and velvety chocolate mousse. 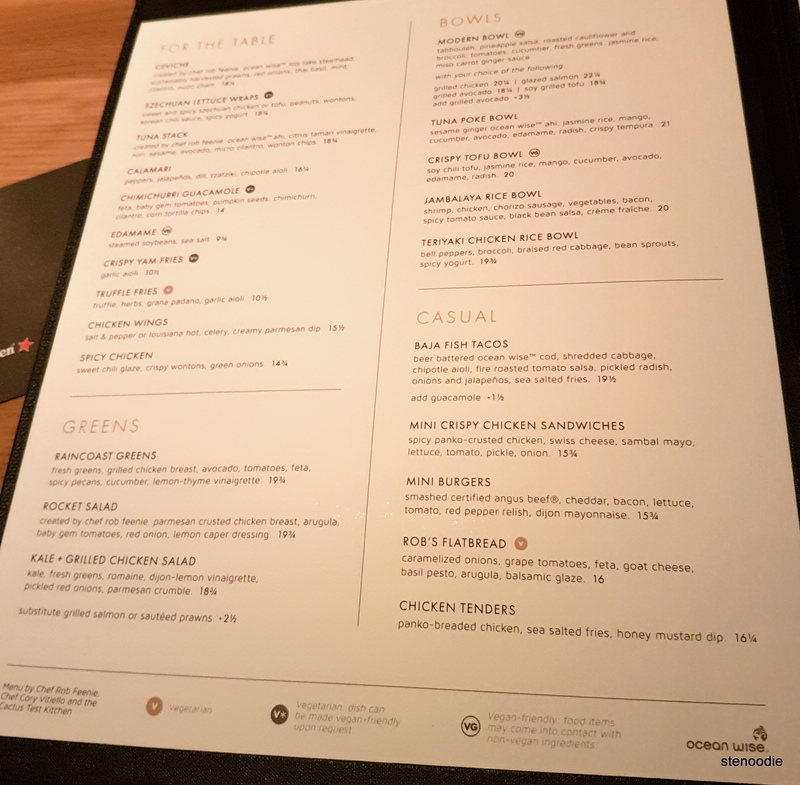 All in all, I liked the meal at Cactus Club Café. They have so many options for dishes that I would need to return to try more. 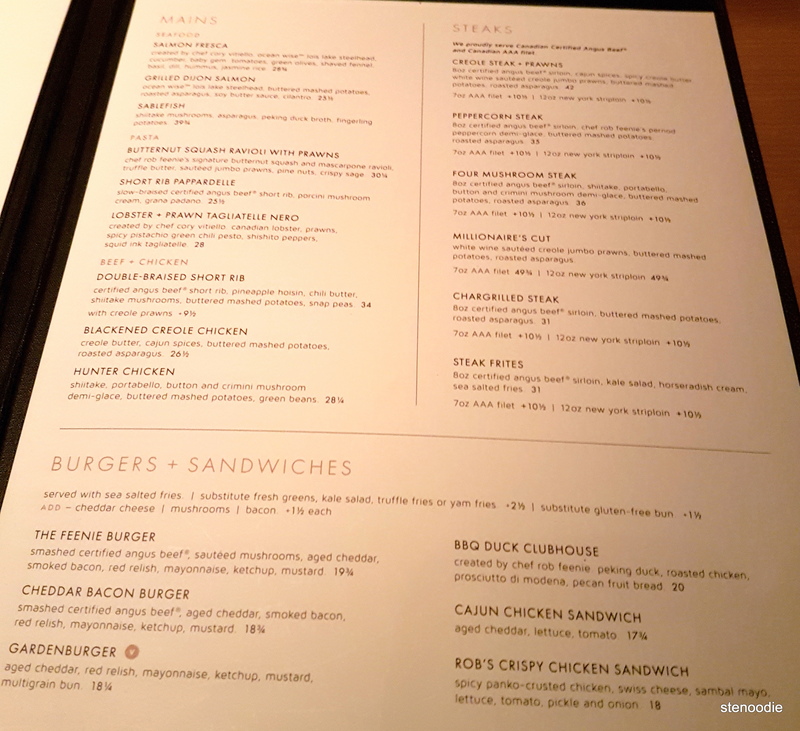 Next time, I want to try their mains like the Short Rib Pappardelle, Blackened Creole Chicken, and various burgers. It’s a great place to unwind after work (they have tons of drinks too and the bar is a popular place to sit and people watch). 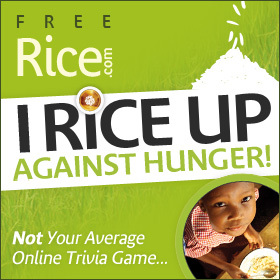 You’ll want to make a reservation because they are very popular both during lunch and dinner hours. 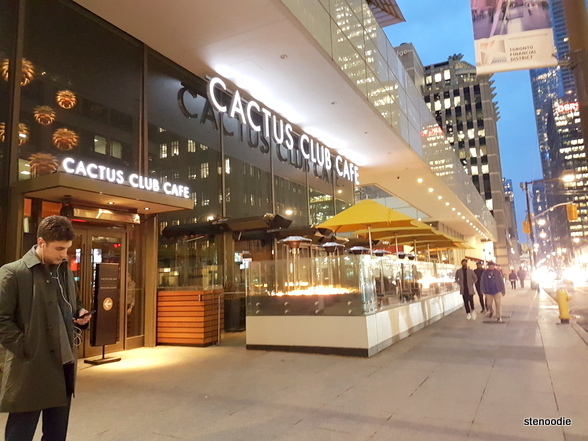 The only thing to note though that because Cactus Club is located in such a big shots area, the prices are premium too to reflect the neighbourhood. I’d still like to come again to try more of their dishes though. This entry was posted in Food and tagged 77 Adelaide St W, @cactusclubcafe twitter, Bay and Adelaide restaurants, Butternut Squash Ravioli, Cactus Club, Cactus Club Café, Cactus Club Café food reviews, Cactus Club Café menu and prices, Cactus Club Café shareables menu and prices, Cactus Club Café Toronto, Cactus Club Cafe First Canadian Place, Caramel Chocolate Mousse, Chef Rob Feenie, Chimichurri Guacamole, Crispy Tofu Bowl, Financial District, Financial District restaurants, food blog, foodie, restaurant review, restaurants near Bay and Adelaide, Toronto, Toronto food blogger, Tuna Stack. Bookmark the permalink.